As I've mentioned numerous times before, I'm always on the hunt for a good deal. There's no reason to pay high dollar prices for fashion pieces that will inevitably go on sale. 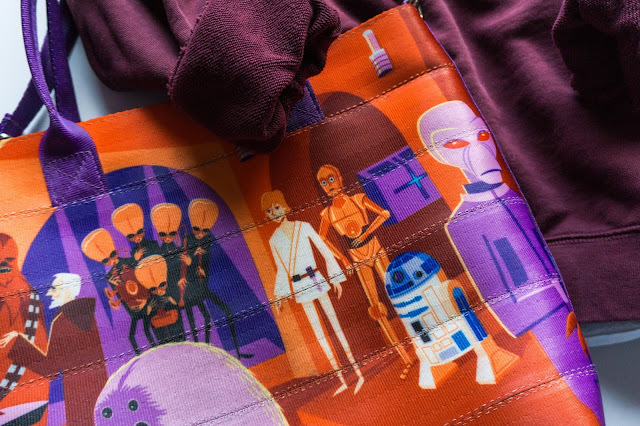 One of my favorite places to shop for Star Wars style items is shopDisney. In the recent years, shopDisney has evolved from what seemed like a kid's store into something for the whole family now. They carry multiple Star Wars fashion brands and oftentimes mark down pieces when a new season of fashion is on it's way. Today I found a few really great Star Wars items on sale that I've been eyeing over the past year and wanted to share them with you. Whether you're looking to add activewear, jewelry, bags, or sweaters to your Star Wars style collection, there is something for everyone in this sale. Plus if you shop today (Monday, July 16th) there is currently a discount code where you can get an extra 25% off your entire order. Enter the code DISNEYPAL (excludes the Alex and Ani items) to get this extra deal, but hurry because it ends today. The prices I've listed below reflect the sale BEFORE adding the extra 25% off code. You can get these pieces on deep discounts if you shop today! I own this sweater in the oatmeal tan color and I absolutely love it. It's such a good quality piece to add to your wardrobe and I love the very subtle Star Wars design influence. This would be a great piece to grab now and stow away for fall when the temperatures start to drop. The cream colored version is on sale for $74.98! 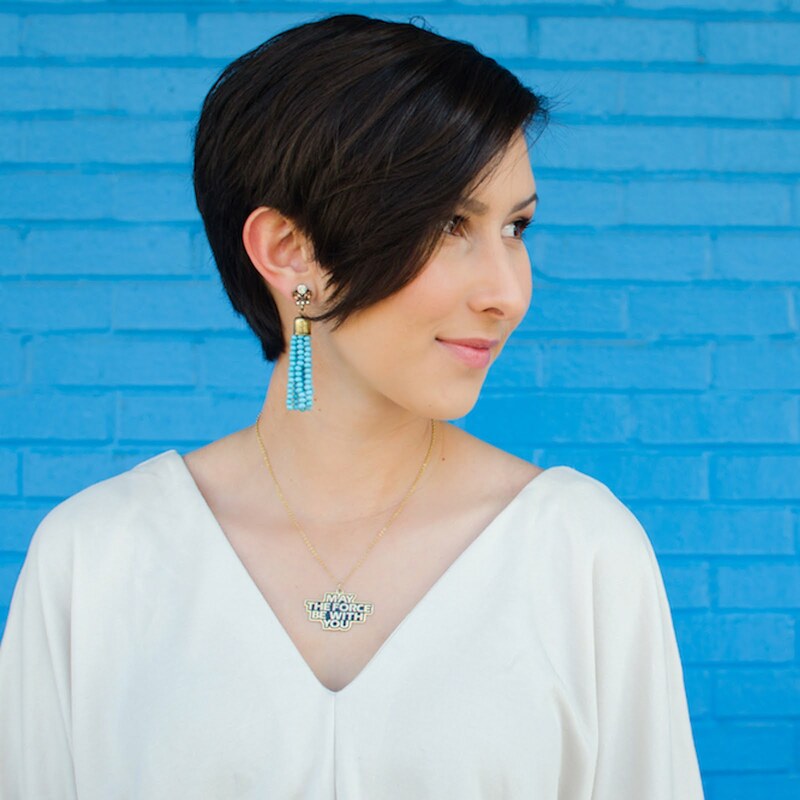 I've been a huge fan of Alex and Ani ever since they started designing for Star Wars and Disney. This Imperial Crest bangle is absolutely gorgeous. While the silver bangle is already sold out, I think the gold style is really pretty and would look great along with other bangles if you mix the metallics or you could even wear it alone. These leggings are so fun! I would totally wear these while working out, running errands, or just lounging around the house. Star Wars activewear for adults is usually few and far between so I'd grab these leggings before they're gone forever. The matching top is also on sale if you want to complete the look. I find your lack of sparkly bags disturbing. This Vader cross body bag is a fun statement piece that would add some Star Wars flair to a simple outfit. This would be a great gift for a tween/teen girl or anyone who loves Darth Vader! If you're like me and shop for Christmas year-round, this would be an inexpensive item to get now and stash away for when you need a quick gift during the holiday season. I didn't want to publicly admit this, but I love porgs. They were really overwhelming during the promotion of The Last Jedi, but I'm a sucker for their adorable personalities in the movie! This backpack is super soft, pretty spacious considering the novelty design, and very well made. This would be a great bag to carry around the Disney parks or take to class. You'd definitely make tons of new friends at school with this conversation piece! Inspired by Kylo Ren, this sweater screams "Star Wars" in the most subtle way. If you were passing by on the street, this would just look like a really pretty black sweater with ribbed sleeves. However, to a Star Wars fan, it's obviously Kylo Ren streetwear. The sleeves are inspired by his costume and the silver flecks across the front resemble the silver metal detailing on his helmet. This is a great deal for such a staple piece. You could wear this with jeans, a cute maxi skirt, or even over a dress when it's cold. Just like the Imperial Crest bangle, this bracelet is only available in gold. The blue detailing behind the Jedi Order crest would be a great pop of color in an otherwise similar toned collection of bracelets. Whether you are a light side sympathizer or a dark side warrior, these bangles are beautiful jewelry pieces to show off your allegiance. Which of these items will you be shopping for today? I'm really leaning towards the Alex and Ani bracelets. I rarely see these on sale and these would look great with my summer outfits!